Yesterday we reported on a new attraction at Discovery Cove, but it appears that sister park Busch Gardens in Tampa is also announcing not one, but two new attractions for the coming year. The two are inter-related and inspired by one of the fastest animals known to man – the cheetah. Cheetah Run is a new area at the park dedicated to the fast cat. Located in the former home of the Budweiser Clydesdales, guests will get the chance to witness Cheetahs in action. Elevated glass-paneled viewing areas with interactive touch screens will allow guests to learn everything about these magnificent animals. 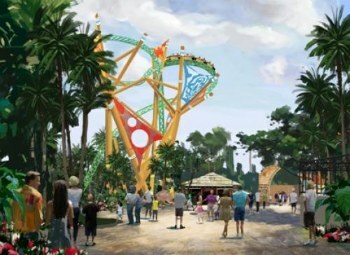 Of course, there has to be a signature ride, and Busch Gardens is covering that with a new rollercoaster called Cheetah Hunt. If you feel the need for speed, this ride is for you. Using Linear Synchronous Motion, which is basically using the force of repelling magnets to propel the ride, Cheetah Hunt launches riders from 0 to 60 in a matter of seconds – THREE times. The first launch propels the train out of its station and into the grasslands that surround the new area. Moments later, a second burst of speed accelerates riders to 60 mph and up into the ride’s signature tower element that climbs more than 10 stories above the African landscape before plunging 130 feet into a subterranean trench. At the far end of this three-quarter-mile path, a third burst of speed rockets the train back across the plain toward the station. I’m looking forward to this new area because cheetahs have always been one of my favorite animals. 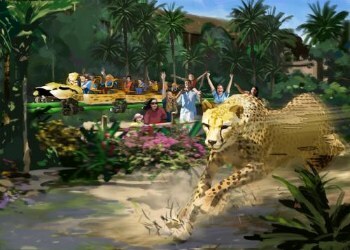 Busch Gardens says that Cheetah Hunt and Cheetah Run will be open in spring 2011.